At last a product that always looks stunning – adding value and style to new and old kitchens and bathrooms. Easy to clean and hygienic (finally no more grout). Every piece is toughened when manufactured so it is heat, water and impact proof. 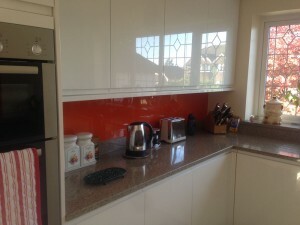 A glass splashback will complement any kitchen or bathroom or shop displays. The sleek and seamless surface is the finishing touch to your room. A glass splashback comes in virtually any colour and is also much easier to clean than tiles. Every glass splashback is unique because project is individual and unique to you. We are happy to provide advice over the phone or to meet you or your builder for an onsite consultation. Our quotations are free of charge. Polished edges on exposed edges. Technical double-glazing blinds and cutting-edge solutions to regulate the light, in all environments, with attractive design, efficient systems for double-glazing blinds with maximum aesthetic and technological comfort. Double glazing blinds to furnish homes, offices and commercial premises and residences and hotels, or public facilities such as hospitals and health centres, schools and public buildings. Venetian blinds, fabric blinds to filter or blackout the light, control units or remote controls: Each situation requires different characteristics, which are solved by the different models and guaranteed through the high quality products we use.